When Little Britain first smacked comedy in the face in 2003, I was immediately on board. A little bit rude, a little bit near the mark, a weeny bit uncomfortable, and very bloody funny. You know when you’re scrolling through the TV channels looking for something to watch and always settle on your classics? Well, mine would be Little Britain, Only Fools and Horses and Seinfeld. That level of comedy just doesn’t age.So when I had the opportunity to read Little Me, My Life From A-Z by Matt Lucas I snapped it up. I had absolutely no idea what kind of person he was, after all, I only know him like millions of others; Vicky Pollard (probably my most favourite), the ruthless Marjorie Dawes, and from before Little Britain the Big Baby from Shooting Stars.The book isn’t chronological; it’s put together as an A-Z. B for Baldy! N is for Nearest and Dearest, T is for TARDIS etc. At Matt’s own admission he’s a bit crap with dates, and so this way works just perfectly for both writer and reader. Reading how little Matt lost his hair, how he made and lost friends, and his one true love was incredibly touching in places. Although Matt is very careful not to divulge too much of his personal life, I felt his writing style changed at these points, and I wanted to reach into the pages with a Cadbury’s selection box and give him a big old hug.http://dai.ly/x4n0wn. my all time favourite Little Britain clipDuffy’s thoughts on Little Me, From A-ZLIttle Me, My Life From A-Z, is not all ‘Tears Of A Clown’ as Matt’s mother remarked after reading the first draft though, so if you are looking for wit old Matty has it in spades. Every now and then a little line appeared which I read in one of his characters voices and I found it incredibly interesting to find out how Matt Lucas and David Walliams came together, their writing process, the harsh old world of the stand-up circuit, and how they broke into the mainstream.Don’t buy this book if you want juicy details on Rebel Wilson or David Walliams. Do buy this book if you want to read about the life of an exceptional comedy writer, and a person full of love, insecurities, and social awkwardness, just like the rest of us.If you love comedy, good writing and memoirs, get it! 4.5I wish there were 50 more letters of the alphabet... felt like I was having a cuppa with a very interesting, charming friend and I didn't want it to ever end.I will say for a first book, the writing is moving but the tone is a bit choppy... I am trying to only judge on content though. Would love a bit more opinion but it's all quite nice just the same. Despite not being overly familiar with Matt Lucas' works, I still found this a thoroughly interesting and satisfying read. The A-Z structure worked well and helped to bring some fresh air to each new chapter, although a timeline of events at the end would have been useful so as to quickly and easily clarify where various things happened in relation to each other.His tone was engaging, fair, and honest - all of these things I appreciated - whilst still managing to keep a relatively light hearted/witty air about it. I particularly liked how his selection of anecdotes wasn't kept to only those that might paint him in a good light - he provides a varied, and reflective insight into his life and career so far.I would highly recommend this book, whether or not you are familiar with Matt Lucas' work. Throughout the story, it feels as if you're talking with an old friend. He opens the window to reveal many things, people, and memories that he holds dear to him, and the feelings of happiness, loss, and determination that he has felt and continues to feel, while never revealing too much and overstepping the narrator-reader relationship. He shares enough for us to see both him and our own reflections in what he says.To conclude: it was just the right length, featured a lovely surprise in the middle, and was an equally informative and enjoyable read.P.S. I find it hard to believe his claims that he lacked academically considering the high quality of writing in this book! Never heard of Lucas, just read the book because the title is good for a giggle. Basically, it's charming, a couple times made me laugh out loud, and very direct with the whole "kids are little shits and we all know it because we were them". . . thing. That said it's not a little sad. I can empathize with a lot of it.Definitely recommended to youth LGBT because it's always good to a story that both has some hope, and shows how much harder it used to be (if not how much harder it was before even that). That's not the biggest help, but it is one. And I think we're all glad the club scene is basically outmoded unless you're actually into that kind of thing (in which case you can still do it). Kinda depressing tho -- I myself fell into isolation and just never crawled back out more than 10 years back, so a slightly hopeful narrative is just a vague reminder "Of course, some people just fail/fall through the cracks/whatever, I mean, surely you've noticed the people who clearly didn't get a happy ending?" On a happier note: Go for the audiobook, really well done and, I won't spoil it, but something spectacular and ridiculous happens and. . .why the hell do more people not accept the fact that A: They're actually talking to someone for hours and hours on end and B: You can do things other than talk. -- I could write pages about what I'm really getting at here, but the key point is this book does something fun. Yay. I picked this up after seeing Matt Lucas on the Graham Norton Show. I've never been a huge fan of Little Britain, though I enjoyed it, but the things he said on the show really intrigued me.For the first half, I found this book quite enjoyable. Matt's humour and honesty really came through and I liked how he didn't always paint himself in the best light. However, I found that as the book progressed, the more impatient I became; I feel that to understand most of the chapters, you need to have seen Matt Lucas' whole back-catalogue. I especially felt like this during the Shooting Stars part, having never seen the show.The format, which initially drew me in with topics arranged alphabetically instead of chronologically, also became a problem for me. At many points it wasn't clear where we were in the timeline and so I feel I didn't get a clear sense of progression that you would usually get when someone is describing their career path and life story.Overall I was disappointed in this. I found that the bits that were supposed to be funny didn't land very well with me and the more emotional parts seemed to be breezed over too quickly. On the whole, the book felt a little off-balance, some seemingly important things barely mentioned, and other things seemed to drag on. I'd recommend this if you're a huge fan of Matt Lucas but unfortunately this wasn't for me. Far from a disappointing memoir, Matt Lucas’s “Little Me: My Life from A to Z” is a worthwhile read for his fans. What might appear like an effortless career is revealed to be built on decades of determination. Lucas is delightfully self-aware of his fame and even jokes about each time he name drops a famous connection. His choice to organize his stream of consciousness memories alphabetically is creative, and it makes transitioning to each new letter something to be anticipated. He is quite self-aware, respectful of others and their privacy and foibles, while also honest about his own quirks and keeping boundaries about his privacy while revealing much to his readers. The fact that he wrote this himself without a ghost writer should also be acknowledged. This was never an autobiography I expected that I would read, having been a fan of Little Britain at one point and then really not liking it later down the line. However, Matt Lucas writes with such honesty, but also warmth, that it's hard to not want to know more about him. I think it paints a very truthful portrait of his life and his determination to reach the level he's at now in terms of not only fame but just whereabouts he is in life generally. It's a fascinating read, and if you're also a creative, it does a bloody good job of inspiring you to push yourself further and work harder to achieve ambitions. And I think that's just what I needed at this moment in time. So thank you, Matt Lucas. I'd only really known Matt Lucas from Little Britain when he appeared in Doctor Who as Nardole. And he was unexpectedly really good. Especially when they brought him back for a whole season.So when I saw this book in a bookstore, I was curious. The non-linear way Lucas had laid it out was intriguing and a page into the chapter about Doctor Who I realized I wanted to read the whole book. So I bought it. He really is a very good writer and he remains in little doubt about what his rise to international stardom has entailed. He's the sort of person who could be friends with nearly anyone and it really shows in this book. OMG what a great read. I simply adore Matt Lucas and Little Britain. Matt tells his "story" in a fun A-Z format. Matt mainly focuses on his early life at school, sports, some family life and then later his comedy career. Note: this is not one of those tell-all biographies that's full of juicy sexual exploits and celebrity mudslinging. Matt does drop quite a few names but unless you're British or an expert on British comedians, it's usually people most Americans have never heard of. All and all a wonderful book and must read for all fans of British comedy. I found this book at around 2:30AM on a fire hydrant at the corner of Pacific and Mason: I'm pretty sure I'm the only person within an eight-block radius of that hydrant who would have had any interest in reading it. Anyway, it's a lovely memoir, by turns funny and moving, from a very unique talent, who will always be best known to me as "The Man With the Scores, It's George Dawes! (He's a Baby! He's a Baby! )".I will say that Mr. Lucas avowedly has some very serious neuroses regarding food. ✨ ✨✨✨✨✨✨✨✨✨Obviously for fans of shooting stars and little Britain. Which I am. I enjoyed reading about Lucas, s early life and how a chance meeting with Bob Mortimer at a comedy club started his journey. There is lots of pathos in this as well, and the suicide of his estranged husband still affects him. Real tears of a clown stuff. But I enjoyed it marvellously, except his mini rant on brexit. Like many wealthy celebrities who don't live in Britain he's a negative opinion on it. An interesting memoirMatt Lucas doubtless has much more to give us in his life. This memoir, written while he was filming Dr Who apparently, is written in an A to Z format. An interesting choice which means that we bounce around in time like a ping pong ball from his youth to the current. I think he could have done more with X. When I read the first couple of pages in my local bookshop, I knew I was going to enjoy reading this insightful and honest account of one of my favourite British comedians. There's a very sober, sombre and serious side to this bubbly and eccentric personality, which his fans will come to appreciate by the time they've finished reading this. Listened to this on audio book. Lucas narrates and it's brilliant! So much personality and I felt like I was sharing a story with a friend rather than listening to audio. I was t overly keen on the non-linear timeline (thanks to the A-Z aspect things keep going backwards and forwards in time) but other than that I really enjoyed it. Loved be song that was played at the halfway point too! Read this book in 2 days whilst off sick. What a fantastic memoir. Laugh out loud funny and helped cheer me up even when I was feeling as rough as a badgers! Some people might not like that it’s not in chronological order but I love that Matt Lucas has done an A-Z of his life (that’s how I would write an autobiography), the photos and the song half way through. Highly recommend! Overall, I enjoyed spending time in the A-Z of Matt Lucas. While the book wasn't as laugh-out-loud funny as I was expecting, the book was filled with details about Lucas' life (his father's imprisonment and death; his struggle coming out) which audiences will not be familiar with and I found interesting and touching. A brilliant read whuch I blasted through quickly. I've been a fan since the early Paramount stuff and it's good to see lots of mentions for the pre-Little Britain work (along with Jane Root proving her utter lack of ability with comedy.) Funny and touching. A very honest, insightful and amusing memoir from one of Britain’s great comedians. His determination and innovative ideas shine through. Thank you for sharing your life with us so far with all it’s ups and downs. A good holiday read. I listened to the audio version of the book narrated by Matt himself. He has had an interesting life and lots of self-made opportunities. Interesting to hear about his relationship with David Walliams. A must for Matt Lucas fans. His honesty and humor come through in this story of how Matt made a place for himself in the world of entertainment. Delight to read. Life from A to Z indeed, with all the happiness, success and sadness it can bring.Thank you Matt for sharing this in your book! Very easy to read and honest A to Z of Matt’s life. It feels more like you’re chatting together than him telling you a story. Wonderful. A very light, enjoyable and silly read. I was in stitches remembering the Georgie Dawes bits of Shooting Stars. A lovely book. He seems like a genuinely nice bloke. Spectacular. Will write a review, eventually. A very honest, entertaining and at times very moving memoir, well worth a read. I won't lie - I have mixed feelings about this book. At first I couldn't put it down because I was enjoying it so much, but then I was reading one chapter a night just hoping the book would finish. I guess this book isn't right for someone who only knows Matt Lucas from Little Britain and Come Fly With Me and doesn't care much for anything else. However, I am extremely glad that I read this book; although it isn't gripping and it isn't binge-worthy, I feel like I know Matt much better now, and what an interesting life he has had! A lot of questions I had watching Little Britain or hearing about Matt Lucas's life were answered in this book with complete honesty, leaving things too personal to himself. I respect him for that. On the other hand I think I wanted to know more about him than I did his career, and this book didn't give me that. I waited a long time to read this book, and I definitely did enjoy it and would one hundred percent recommend it - but I wouldn't even consider reading it again. It was just too boring to read again, and I think I should have been more familiar with his other work to really appreciate the book. 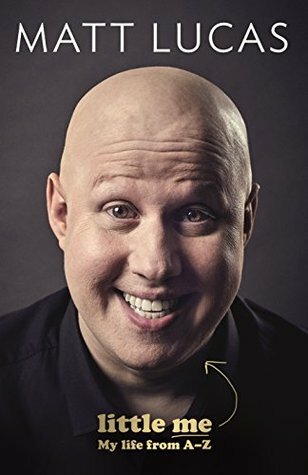 However, I'm glad I read this and I have no regrets and if you're a fan of Matt Lucas or curious at all about his life, I would definitely recommend that you pick up this book. I thoroughly enjoyed the majority of this book, and I'm so glad I got this as a birthday present.